The Pacific Beach Town Council’s 11th annual cleanup has been scheduled for May 4, from 9am until noon. 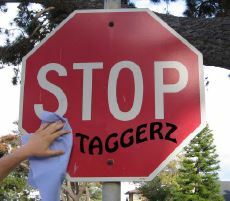 Each year hundreds of tags are removed, greatly enhancing the appearance of our community. 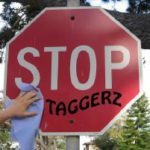 Removing 100s of tags each event! We’ve got all the materials and training you’ll need. Join us in a community service that shows! Refreshments provided. In addition to volunteers needed on the day of the cleanup, advance work needs to be done by graffiti mappers/surveyors. If you can help, please email Jim Menders. Volunteers under 18 must have a waiver signed by a parent. Hours qualify for community service credit. Forms and more information are at the PB Town Council website.